In the US, the idea of avocado as a sweet is something outside the realm of most of our experience. 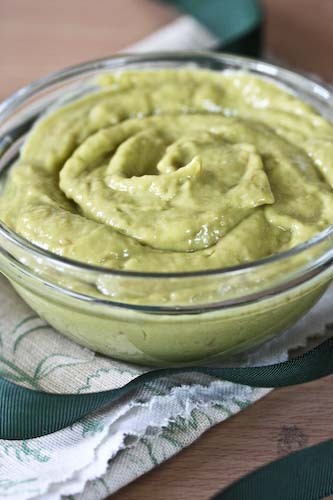 But in Brazil, creme de abacate is quite popular, whipped folds of bright green avocado spiked with a myriad of flavors. You might resist at first, but stop for a moment and think about that buttery texture, the subtly sweet flavor (it is, after all, technically a fruit), and I have a feeling your defenses might start to fall. I've seen a couple of avocado cream recipes, most are brightened with lime juice, some are sweetened with brown or white sugar, thinned with milk or half-and-half and a bit of port, garnished with mint or lemon. Not far from avocado ice cream, if you wanted a dessert even more redolent of summer, you might beat in whipping cream instead of the wine and freeze like ice cream. Or you could heap the avocado cream into a baking dish and top it with homemade meringue and bake like a more exotic lemon-meringue pie. The recipe below, however, does something truly wonderful to the avocado. While, as I said, lime makes an appearance in most recipes, in Betty Fussell's version, she beats half a grapefruit into the avocado. The grapefruit's tartness cuts right through the avocado's rich cream, and you're left with the kind of silky, mouth-filling experience normally reserved for only the richest cheesecake. A note of warning, you must actually like grapefruit to appreciate this preparation. R, unfortunately, does not. And so, was not impressed. At least, not in the way I was. Since trying this version, I've begun to crave it. I dream of it at night, and begin beating grapefruit and avocado first thing in the morning. It's meant to serve 2 - 4 people, but I assume this is when it's served after a meal, rather than in place of one. Because I can polish off the whole batch in one sitting. I maintain that you must have a deep love for citrus if you're going to be convinced by this. And if you go into the thing not open to the tartness of the grapefruit, you may as well skip it. But if a lemon bar is more tempting to you, as it is to me, than a bar of chocolate, then you're in for a treat. Remove the grapefruit sections from the peel and put them in either a food processor or blender. Cut the avocado in half, remove the fruit from both halves and add it to the blender, along with the juice of 1 lime and 2 tablespoons of honey. Blend well until smooth. Add another tablespoon of honey if you need it. I definitely did not. Sounds delicious! I've made a raw avocado-lime tart ("key lime"), and have often made the filling alone as a pudding. I can't wait to try the grapefruit version! For a decadent avocado-based dessert, try this chocolate pate! I just discovered the avocado/grapefruit combo and I absolutely love it! That cream looks so good! what an interesting recipe . must be so good. Awesome acovado. I love it. And the color on this is great too. What a unique combination! I've never thought of making a pudding from Avocado but that sounds really yummy! It does totally scream summer too! I really love sweet applications of avocado! Ooh, this looks wonderful. And I love idea of a meringue topping. avocado works great in desserts, it makes the most creamy healthy puddings! thanks for the recipe! i brought it to a july 4th party. it was funny how many people said it was "interesting," which is so true, it's really different. i used locally grown avocados (i'm in southern cal), not Haas, they were sweeter and creamier. any suggestions what to serve with it? wow what a recipe.it is a perfect dish for summer. Wow! Thanks so much! It tastes wonderful!! !